The written word is a powerful tool. Writers can make people feel a wide variety of emotion using nothing more than words that tap into a reader’s imagination… but what if the reader didn’t have to use their imagination? What if the book actually made the reader feel what the characters in a book were feeling? 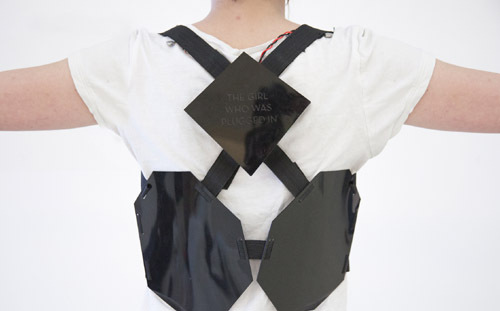 Before you start trying to figure out what a sturdy hardcover book might feel like when you slip it on, you need to realize the Wearable Book isn’t actually wearable, although there is a harness that’s used to transform fictional feelings into real ones. 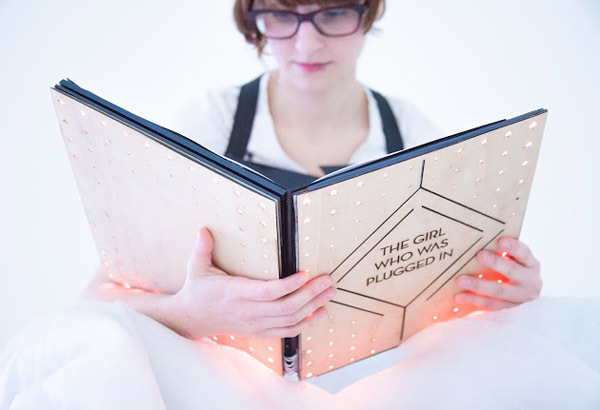 Basically, the book and harness combo works like this – You slip into the harness and start reading. That’s all that’s required on your end of the deal. Then, as you read, the book and harness react certain ways, depending on what page you’re on. If you’re reading a page where the character feels scared, the book will create ambient lighting to enhance the effect and airbags in the harness will inflate, making the harness tighter so that it’s difficult to breathe, which is a normal reaction when one is scared. Personally, we’re perfectly fine with simply reading about a character having difficulty breathing, without experiencing that particular problem ourselves. Can you imagine your physical and mental state after reading a Stephen King book while wearing this harness? We might not survive the experience. Also, isn’t it a little odd to use a traditional book to create an interactive experience when it seems like it would be easier to manage with an ereader? We’re all for making reading fun and appealing to a wider audience but not sure about relying less on the reader’s imagination so we’ll wait and see how things progress with this interesting invention. One thing is certain, however. Technology has forever changed how we read, and those changes are still happening.